Firework Superstore is one of the UK's top retailers and your first stop to buy quality Fireworks online. Buy online fireworks for delivery throughout the UK, or alternatively you can buy online and collect from the Firework Superstore in Glasgow, which is open all year. We stock an epic range of some of the best Fireworks money can buy, and have offers both in store and online with many items discounted..
We pride ourselves on offering a wide selection of the top fireworks available. While some firework retailers offer generic items, we only stock the highest quality fireworks from manufacturers including Absolute, Taipan, and Rage, and many more. This guarantees the safety and quality of our products are always second to none. Over the past 10 years, our company has worked hard to build a reputation for quality, value, selection, and customer service. We can honestly say that we have the widest selection of consumer fireworks in the area. 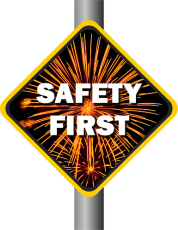 As an established leader in the sales of consumer fireworks, Firework Superstore strives to maintain a high level of quality and safety that has helped to set the standards in our industry. At Firework Superstore, safety is very important. Whether your display is a huge public event, or a small bash in the back garden, preparation is essential. You need to ensure the site is suitable for the fireworks you intend letting off. Our commitment to your firework safety is based in the real world - we won't just print a picture of a "perfect" site in the back of a catalogue and leave you wondering how to squeeze it into your garden! We'll also take a look at safety distances and fall out. Layout, you should not only consider the safe distance for your spectators, but also think about where the fallout will go. Wind Directionis important, we can not stress this enough. Make sure that your spectators are standing with their backs to the wind. Most fireworks have some kind of debris, it would not be too good if this landed on the heads of your spectators. Whilst it is unlikely to harm them, it may ruin the new hairstyle!